Wedding PR: Book More Brides, Tidewater & Tulle, AllSeated, and more! This week brings another great batch of client features, including Book More Brides, Tidewater & Tulle, AllSeated, and more! Keep scrolling to check it all out! 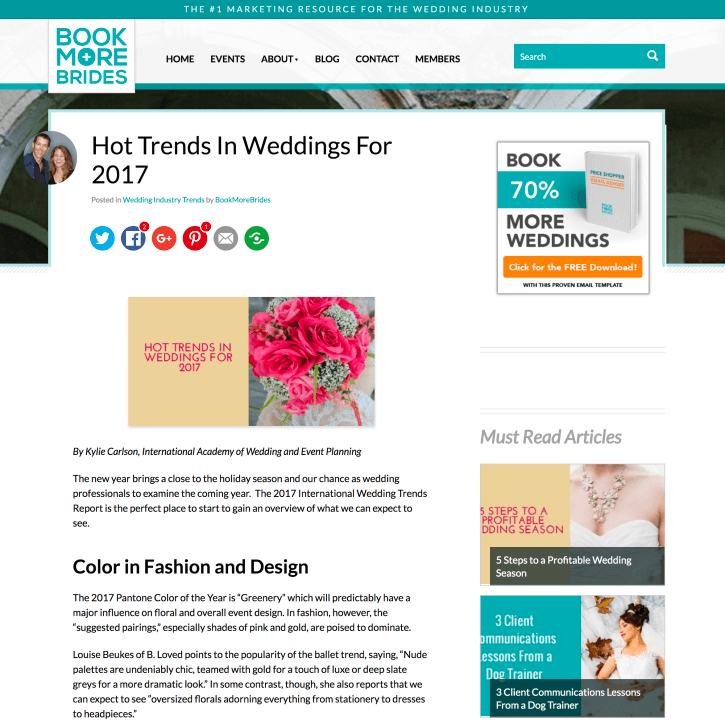 Wedding Academy Live was featured on Book More Brides with their article, Hot Trends in Weddings for 2017. See the full article here. LadyMarry was featured on Refinery29 with her inclusion in the roundup of The Best Apps for Wedding-Planning. See the full feature here. Stephanie Yonce Photography was featured on Tidewater & Tulle with the real wedding of Intimate Winter Wedding with Simple Elegance. See the full feature here. Wedding Academy Live was featured on AllSeated with their article, Hottest Wedding Trends for 2017. See the full feature here. OFD Consulting LLC was featured on Honeybook with their article, Wedding PR: Prepping for a Successful 2017. See the full article here. Wedding Academy Live was featured on Special Events with their article, Millennial Generation Heavily Influences 2017 Wedding Trends. See the full article here. Insight from the Wedding Trend Report (featuring Wedding Academy Live) and images from Kaysha Weiner Photographer, Stephanie Yonce Photography, Don Mears Photography, Mike B Photography and Elly’s Photography were featured on Country Living‘s 10 Country Wedding Trends That Are Going to be Huge This Year. See the full feature here. Wedding Academy Live was featured on Sage Wedding Pros with their feature of 2017 Wedding Trends. See the full feature here.